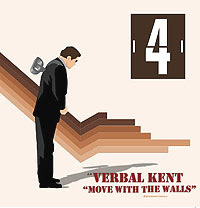 Gravel Records present's “Move With the Walls”, the introspective and powerful sophomore release from Chicago's Verbal Kent. With a near death experience providing the prime motivation for the project, “Move with the Walls” breaks down the reality of a recovery in progress and the will to break free from the confines and the hold of the pain associated. With the help of incredible production, courtesy of Oddissee, Maker, K-Kruz, Overflo, Kaz1 and Earmint, Verbal Kent's ‘Move With the Walls’ is a thoughtful manifesto that fused with classic hip-hop collaboration tracks, alongside such artists as Ill Bill, Tableek of Maspyke, Blade, Earatik Statik, Longshot & Rusty Chains.